1. Purée the watermelon in a blender until smooth. Divide between 6 plastic cups (about 200ml each) and freeze for about an hour or until the juice is completely frozen. 2. Purée the Honeydew melon with the apple juice and lime juice until smooth. 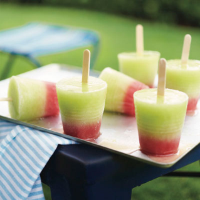 Divide between the frozen watermelon cups, incert a lolly stick into the centre and freeze again until frozen. 3. Take out of the freezer 10 minutes before you need them, unmould and serve. To unmould the lollies, dip the cups into hot water for 10 seconds then remove.